This efficient frontier and CAL template demonstrates how to construct a portfolio frontier and CAL line chart to find the optimal portfolio. 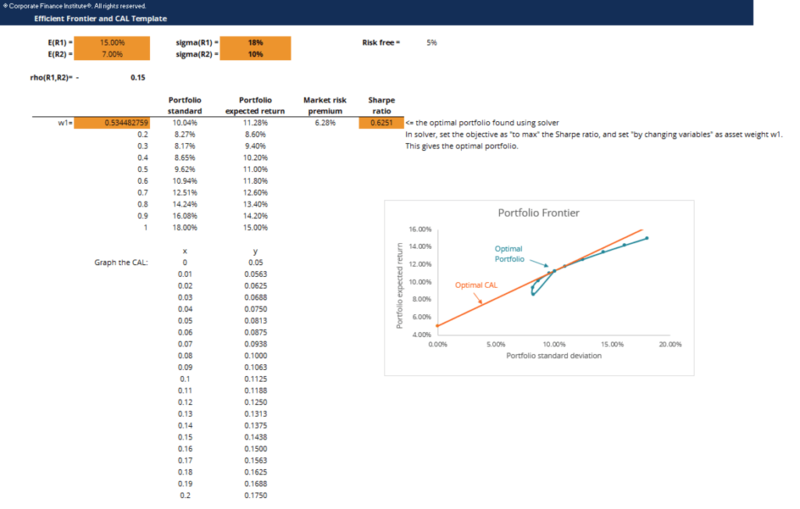 A portfolio frontier is a graph that maps out all possible portfolios with different asset weight combinations, with levels of portfolio standard deviation graphed on the x-axis and portfolio expected return on the y-axis. The slope of the line, Sp, is called the Sharpe ratioSharpe RatioThe Sharpe Ratio is a measure of risk adjusted return comparing an investment's excess return over the risk free rate to its standard deviation of returns. The Sharpe Ratio (or Sharpe Index) is commonly used to gauge the performance of an investment by adjusting for its risk., or reward-to-risk ratio. The Sharpe ratio measures the increase in expected return per unit of additional standard deviation. The optimal portfolio consists of a risk-free asset and an optimal risky asset portfolio. The optimal risky asset portfolio is at the point where the CAL is tangent to the efficient frontier. This portfolio is optimal because the slope of CAL is the highest, which means we achieve the highest returns per additional unit of risk.